I cannot believe it is already March. I have so much I want to do and I feel like I just can never catch up. As much as I feel I am not accomplishing things, I have to stop and remind myself that I am creating my new artistic life. I am moving away from interior design and towards fine art and mixed media. I also have to realize that I am a survivor now… that changes everything. When I think about all that I did before and I have to stop and come to terms with the fact that if I want to stay healthy I have to change my way of life… forever…. 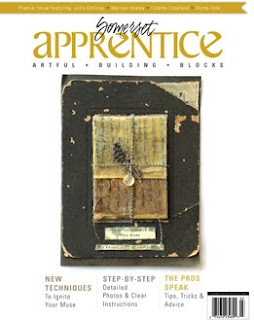 I am superbly honored and happy that I am published in the March 2010 Somerset Apprentice Magazine. I have been creating my mixed media collage style since the fall of 2007. I have sent in a few submissions over the past few years. I had not received this piece back from the publisher for quite some time. We had moved in May and I thought perhaps it had gotten lost in the mail. When I inquired, I was told that they still had the piece and wanted to hang on to it for a bit longer. I was ecstatic when I received word that they wanted to publish it in this edition. The current light in my life has been made brighter by my cancer experience. When I feel down or that I am underachieving I need to study this piece. Thank you to Jana Holstein, Managing Editor of Somerset Apprentice. I can now check another item off of my “list”… of course my personality checks off one and adds two more, but I will have to deal with that issue in another piece of art!